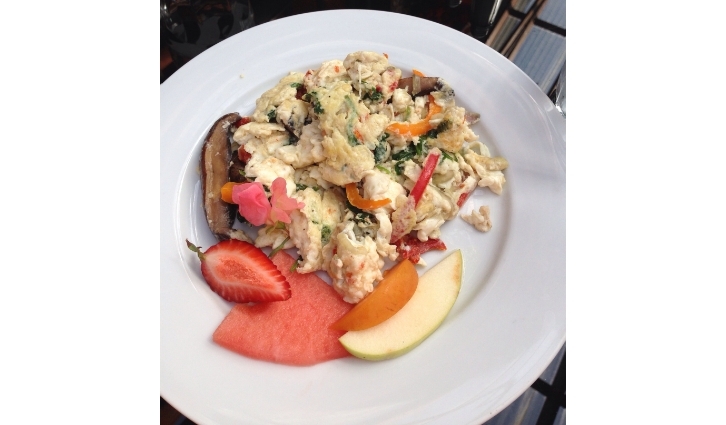 Prudence, Laurel and I all wanted a healthy brunch, so Brambles Bistro made us an egg white scramble with fresh mushrooms, peppers and spinach. It was so yummy and pretty….and good for us too! 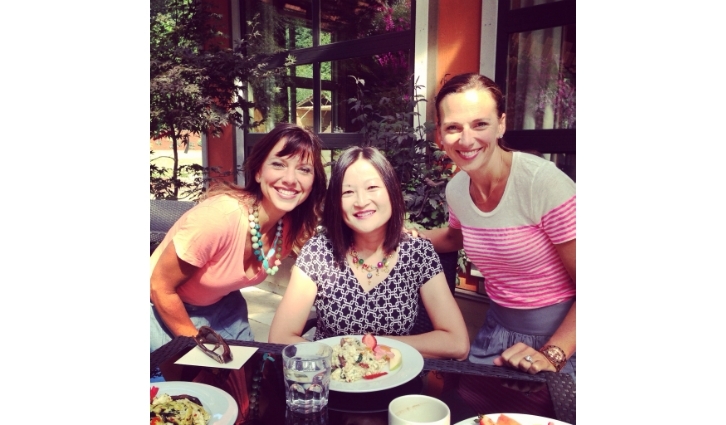 Laurel and I had the pleasure of recently having brunch with Prudence Lau during her visit to the West Coast. Prudence prepared our first SPS tutorial and the topic was croissants! A rather ambitious project! She has made them four times since and says she will never go back to buying store bought! You can view both parts of Prudence’s tutorial Part 1 and Part 2. I first got to know Prudence in high school….that was a LONG time ago! Eek! We reconnected through Facebook a few months ago. Prudence now lives on the other side of Canada in Niagara Falls, Ontario teaching high school culinary arts and a college baking apprenticeship programme….yes, she wears the white coat and the tall white hat! She works for Wilton’s teaching cake decorating and over the past several she has taught over 4,000 students and is the member of their President’s Club. She has had her own wedding cake business, and she now also mentors Wilton instructors and teaches cake decorating at Michael’s. Prudence also has been featured in a textbook highlighting career opportunities in the food and nutrition subject area and has developed recipes that have been published in cookbooks. On top of that, Prudence is training to qualify for the Boston marathon! We chatted with Prudence about food, running, life and overcoming obstacles. We left feeling so inspired that we just had to share with you! 1. You love to bake…how do you stay so slim and fit? You can always have a little bit of something. I allow myself a “cheat” or a “treat” everyday. I try to “correct” or balance anything not so healthy or indulgent that I’ve eaten at the next meal. If I had some dessert at lunch, I will eat a bit of meat and veggies at dinner. Everything is ok in moderation. Have some chips…I like low salt thick cut ripple chips. I will have a few….if after half an hour I’m not satisfied, I will have a few more. It’s ok! 2. What time of day do you like to bake? It really depends on what I plan to eat for the day….or how I feel. In the early morning, I like to make things for breakfast like croissants or fresh, thick and chewy oatmeal craisin white chocolate chip cookies. If it’s mid-afternoon, I might make pizzas, biscuits or breads to go with soups, salads or a BBQ. I might even bake late in the evening to ease a craving for tender chocolate chip cookies which I wash down with a glass of milk. 3. If you have to choice one….breakfast or dinner? Both! After a tough training session, I love going out for breakfast…I love eggs, sausage, veggies, fruit, toast, and smashed potatoes! Dinner is where I love to discover and mix different flavors and I love wine pairing! Exotic and unique flavors paired with the right wine that marries those flavors is a dream! 4. You come up with your own recipes? What is that process like? First of all, I need to be inspired….if I am not, forget it!! I also can’t get too upset when things don’t turn out! I’ve thrown away two batches of custard that I was making for ice cream before I finally got it right! I love to keep experimenting. You can’t change the ratio of certain ingredients, but others you just keep playing around with and tweaking. The key is to have fun and be passionate about what you do. 5. Tell us about training for a marathon…how did that start? I had gone through a tough time personally…a tremendous hearing loss that almost rendered me deaf permanently…quite devastating considering my career involves teaching. My husband suggested that I start running. We together found me a running coach, Benny, and I completed my first half marathon in October 2011. My goal now is to run a full marathon this November….and to eventually qualify for the Boston Marathon! I am running 5 days a week from 50 minutes a day to 3 hours a day! Both my hearing loss and running have taught me that once you overcome your fears and put your mind to doing something, ANYTHING is possible! 6. How do you fit running in with such a busy career? You just have to make it a priority. If I have to get up at 5:30am to get my run in before my work day starts I do. I often come home to my hubby reading the paper and eating breakfast before he’s off to work…grrr…But I really do enjoy the training! It’s my time away from everything and it’s when I do a lot of thinking and planning! I would love to go back to Santorini to the town of Oia…it’s beautiful and calm. There are lots of “stray” but tame dogs who lead you on walking tours…so cute! I’d also go back to Istanbul in a heart beat…it’s crazy, chaotic, noisy, colorful and full of culture…oh, and the food is awesome! Next on our list is Thailand, Vietnam, China, Malaysia and the Maldives. Thanks so much for taking the time to meet with us Prudence! You truly are a testament to living life to the fullest, to taking on new challenges and to being confident in who you are! And you sure can rock those sweet Coach shades! Prudence has promised us a live tutorial in our kitchen next time she visits the West Coast….we can’t wait! You can follow Prudence on Twitter @EatwithP .